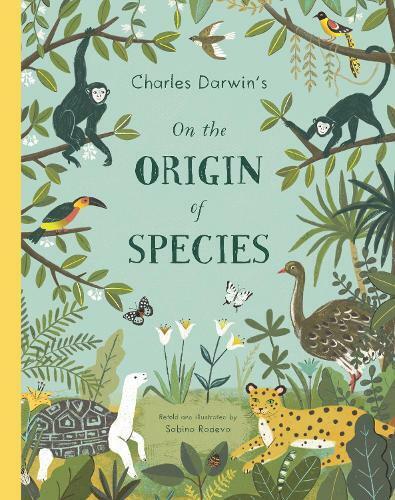 The first ever picture-book retelling of Charles Darwin’s On The Origin of Species; this accessible work brings evolution to the younger generation through stylish illustrations and a simple, easy-to-understand text. Pulling together Darwin’s observations from his travels around the world and his groundbreaking - and controversial - explanation of how species form, develop and change over hundreds of thousands of years, On The Origin of Species is as relevant and important now as it ever was. I’m excited by beautiful, informative books that inspire young minds to wonder and ask questions. Sabina Radeva’s inspired retelling of Charles Darwin’s seminal work On the Origin of Species is just such a book, using an amalgam of history and science with beautiful illustrations to make Darwin’s insights accessible to open minds of all ages. It explains species and the variations within each, domestication and migration as well as Darwin’s theories of evolution and natural selection, in language that’s easy for all to understand and conveys the great scientist’s sense of wonder and excitement, often in his own words. There’s important additional material at the back of the book, including the contribution by Alfred Wallace (an important mind of Darwin’s time), new ideas such as epigenetics and (most significantly) corrections to popular misconceptions that some hold even to this day. There’s an invaluable glossary for younger readers and a list of further reading for budding scholars. This is a wonderfully multi-layered book that the whole family can savour and enjoy for many years. Very highly recommended for ages 6 to adult.